Gary Clark, President CNP Quad Squad - Crowsnest Pass Quad Squad appreciates the concerns voiced by scientists who have written an open letter to the Minister of Environment. This letter argues for a ban on an activity enjoyed by thousands of ordinary Albertans who use purpose built ATV trails in the Castle Area. While the letter does add to our debate, it is very one-sided. If one agrees to the tone and conclusions of the letter, we would not need elected officials who strive to balance conservation, economic development and recreation. Let’s remind all Albertans that this is not the first Open Letter. In June of 2015, over 100 scientists wrote an Open Letter calling for a moratorium on oil sands development because the “science is clear.” In March of 2016, over 60 scientists penned another Open Letter calling on the Prime Minster to reject the proposed Trans-Mountain pipeline. In May 2016, 90 scientists again wrote a letter to the government of British Columbia to stop the approval of a proposed Liquefied Natural Gas project. There are many Open Letters and many share some of the same signatories. There are fewer than 600 km of usable trails in the Castle area. We have always agreed that the government needs a designated trail system, not only in the Castle, but throughout the province. Other provinces in Canada, and areas in the US, have shown how properly constructed trails can be environmentally integrated into the system. Trails that lead nowhere, or trails in high biodiverse areas should be closed to allow for natural regeneration. The trail system we have urged the government to adopt in the Castle area covers less than 200 km. This is two-thirds less than the trails we have today. Millions of dollars were invested and thousands of volunteer hours were spent building trails and bridges in the Castle area. Our aim is to protect the water and fish habitat, restore riparian areas and move trails where required to accomplish this. It is also important to understand the government plans to turn these same trails over to non-motorized use. A trail is a trail, regardless of who uses it. There will still be the same compaction, and run off issues, as evidenced in other Parks with non-motorized trail use. The letter also argues for the protection of large carnivores. It is interesting to note our own provincial scientists have noticed a large increase in the bear, wolverine, and wolf population in the Castle area, despite present OHV use. This also indicates an increase in their food sources. Some of the science is based on displacement of wildlife impacted by roads, not small trails. This is significant because the government has just announced million dollar expenditures on waterlines and paving roads to Castle Mountain Resort. It seems they are ready to disturb the environment to accommodate some groups of users at the expense of others. The letter also notes the displacement of wildlife due to OHV noise. What they fail to mention is that this short displacement is quickly recovered once the OHV’S have passed. As environmentalists, and their friends in academia, attack every activity which makes life possible in Alberta, we need to pause and consider for a moment what would happened if our government were to agree to every “the science is clear” Open Letter. Alberta would come to a stop. Our economy is still dependent on resource development, and our environment provides employment and recreation. We live in wooden houses from the forest industry, use steelmaking coal to produce bridges, wind turbines and high rises. We extract oil and gas to fuel cars, planes and our considerable exports. Like it or not, the world needs our resources and is it not better for us to produce them, with our strict environmental standards, then in other countries with lower standards? Yes, the environment is important, but we must find a balance. The Crowsnest Pass Quad Squad has worked hard to develop this balance. We were the first to physically do something to protect our headwaters. We were the first to protect our fish habitat and, sadly, we are the first to get kicked out of the Castle. Except for our partners, Cows and Fish and the Oldman Watershed Council, never have we witnessed any of these scientists come help restore the riparian areas, or build bridges across the water. 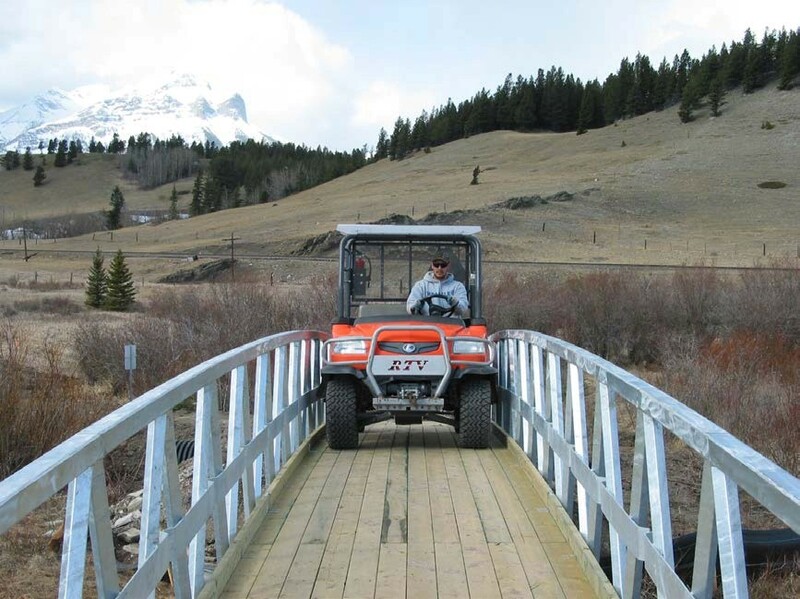 The Government of Alberta must listen to Albertans and bring balance to the Castle area by sustaining proper trails on a designated system, and allow OHV use on a smaller scale. All Albertans have the right to enjoy our heritage. The Scientist’s Open Letter is about SCIENCE. It predicts the consequences of continuing on with harmful activities like OHV use. Of course, as a society we’re free to say, “We don’t care about the environment. We’re going to continue to trash it for our own gain or, in this case, amusement.” It might be foolish and shortsighted, but we're free to do so. Fortunately, this government has chosen to make conservation and protection the priorities in the Castle. The government is to be applauded for taking this stand. Saying we need more “balance” is a code for “the environment must give up more.” We have swung so far towards development and exploitation that If we truly wanted “balance” we would be returning far more land to a wild and undeveloped state. To paraphrase another commentator on a different forum, I’ll take the OHV lobby more seriously when they’re out protesting for the recovery of Westslope Cutthroat Trout and voluntarily removing themselves from critical landscapes. The first to protect our headwaters? I appreciate your gusto, but let's get real here. I find it pretty hard to believe that there was zero activity in this area until OHVs emerged 60 or so years ago. Certainly our displaced Indigenous friends contributed to the stewardship of the Castle long before motorized vehicles entered the fray. It is quite amusing to see people put no trust in science when it comes to their recreational activities, but will trust science with their life when it comes to their health. Yes, there have been endless scientific protests over various subjects over the years, but let's focus on the Castle, an area that is on the verge of having some endangered species become extinct if drastic changes are not made. Is any one OHV rider willing to have their name (and their family name) go down in history as being the one person who made an entire species become extinct? I didn't think so... there is always someone else to blame. Yes the CNP quad squad has put a lot of taxpayer's money (grants) and volunteer time into building bridges and repairing trails just so that the OHV riders (and nobody else)have a place to play. One would think after 80,000 hours and millions of dollars spent, a change would be made in the environmental devastation in the Castle region. It hasn't and the area continues to get worse, despite the efforts of the club. They simply cannot control the activities of all OHV riders and neither can the government. It was publicly posted online that random campers were not allowed to camp within 600M of a provincial recreation area, yet people constantly camped right outside of the Castle River, Castle Falls and Lynx Creek Recreation Areas. It was also posted about the minimum distance campers could be by waterways, but that regulation was also ignored. There were signs posted barring OHVs from being used in Provincial recreation areas, also ignored. Is it any wonder the government chose to close down random camping? I do believe that the OHV riders should have a place to ride, but it needs to be away from sensitive areas and set up on a pay-for-play basis so the user funds can go directly back into upkeep just like activities like golfing, car racing, Provincial Park camping, National Park camping and many more. Many areas throughout North America have done this successfully and those that have not are sitting in the same situation we are in here in Alberta with the minority of the population telling the majority of the population that their personal recreation preference should prevail at any cost. Gary, Pavlov's theory on animal behavior contradicts your statements on how noise affect wildlife and it is odd that you would chose a statement that it is' better for us to produce with our strict standards' when you are standing up for an industry that has no production in Alberta and the majority of the OHVs are produced in counties with lower standards. You are also asking the government to lower their standards so the OHV riders can continue to ride high GHG producing vehicles in environmentally sensitive areas. I live here and enjoyed the Castle area much more before the OHVs took it over going back 25 years. There are lots of videos on you tube showing people riding OHVs irresponsibly in the Castle region and some are very new. The OHV community may not trust what the scientists are saying, but given the evidence, how can the majority of the Alberta population trust what the OHV community is saying. With the up coming discussion on the OHV Bylaw in the Crowsnest Pass, I must question Gary Clark's choice for a photo op. The bridge that he is parked on is at the end of Willow Drive and was placed there to be a part of the non motorized community trail. The bridge has a sign on it stating "non-motorized use". It also had a barrier at the entrance as well so OHV's couldn't use it. It also leads to private property which is part of the reason the trail has not continued. When I see a picture showing this total lack of respect for a Municipal Bylaw, I'm hard pressed to believe anything Gary says is credible in his letter.